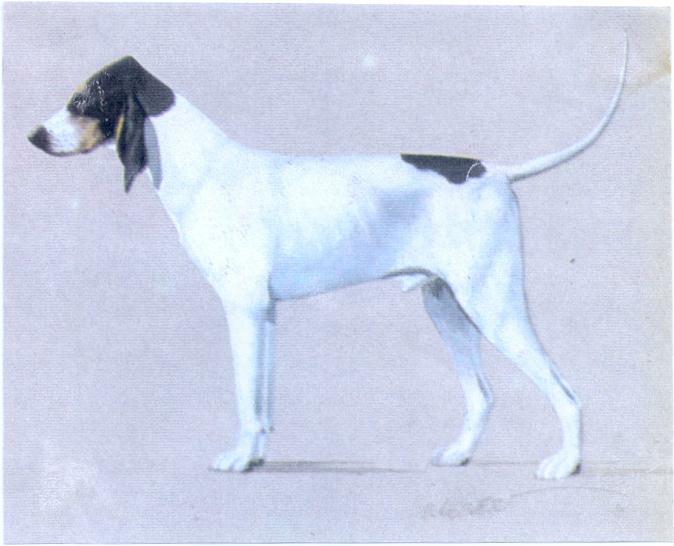 : Scenthound used for driving game to waiting guns and for coursing. His medium size and lightness make him a precious auxiliary, whether he hunts on his own or in a pack, capable of evolving easily on difficult terrains. Hare hunting is his favourite type of hunting; but he is also used in tracking roe deer or wild boar..
: Originates from the Ariège, product of a crossing of a Briquet with a “chien d’ordre” (scenthound hunting in a pack) which could have been the Bleu de Gascogne or the Gascon Saintongeois. Physically he has kept the typical characteristics of the “chien d’ordre”, with, however, less distinction, less size and more lightness. : Light dog, medium size, elegant and distinguished. : Behaviour: From his origins he is hardworking dog being at the same time very good at driving game to the waiting guns and showing proof of much initiative and enterprise. He has a resounding voice and is quick in his plotting. Character: Happy and sociable; easy to train. : Seen from the front, slightly domed, not too broad; the occipital protuberance only slightly marked. Seen from above, the back of the skull is of lightly pronounced ogival shape. The forehead is full. Superciliary arches only slightly marked. : Black, developed; nostrils well opened. : Nasal bridge straight or slightly arched; muzzle of equal length with that of the skull. : Tight, rather thin. The upper lip must just cover the lower jaw but without giving the muzzle a pointed profile. : Well open, brown; eyelids without looseness. Alert, bright expression. : Fine, supple, curled in, must be able to reach the onset of the nose without going beyond its extremity. The leather is narrow at its base and is set just below the eye level. : Light, rather thin, long, slightly arched. : Well muscled and sustained (firm). : Well fused, slightly arched. : Ribs: Long, moderately rounded. Chest: Long, medium width, let down to elbow level. : Flat and slightly drawn up. : Well set, fine at its extremity, reaching the point of the hock. Carried gaily, sabre blade style. : View of the ensemble solidly constructed. : Moderately oblique, muscular without heaviness. : Elongated oval, i.e. “harefeet”; toes lean and tight. Pads and nails black. : View of ensemble well proportioned. : Quite long and muscled without excess. : Well set in the axis of the body, well let down. No dewclaw. : Fine, supple, not closely adherent to the body but not allowing the presence of dewlap, folds or wrinkles. Mucous membranes (hairless zones) black. : Short, fine and dense. : White with jet black markings with well defined outlines; sometimes mottled. Presence of quite pale tan on the cheeks and above the eyes. : Males 52 to 58 cm. Females 50 to 56 cm. Head: Skull flat or too pronounced dome. Profile of the extremity of the muzzle too square. Presence of wrinkles or dewlap. Eye round; haw apparent. Leathers too flat; thick, badly set, too long or too short. Body: Excessive volume. Slack (soft) back. Drooping croup. Limbs: Insufficiently developed bone structure. Cow hocks seen from behind. Splayed feet. Any coat other than schedulded in the standard.